Buy online Arabescato Carrara Herringbone Pattern 12 in. x 12 in. x 10 mm Honed Marble Mesh-Mounted Mosaic Tile (10 sq. ft. / case) SMOT-ARA-HBH and leave review or share with Your friends. MS International Arabescato Carrara 12 in. x 12 in. 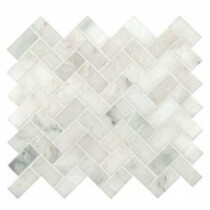 Honed Marble Mosaic features a mesh-mounted sheet of white marble in a herringbone pattern. Any decor is enhanced by this chic mosaic. This enamoring mosaic can be use on the wall or the floor to create magnificent designs.